The tragedy of the Japanese earthquake and tsunami has produced chaos on the island of Sakhalin. What little information is available is regarded with suspicion. Ksenia Semyonova monitors the mounting panic. “Yesterday the head of Rosatom [the Russian Federal State Atomic Energy Agency] said that Russians have nothing to fear and that the accident at the atomic power station Fukushima-1 will not affect Russia. I live in Yuzho-Sakhalinsk and can see what’s actually happening. 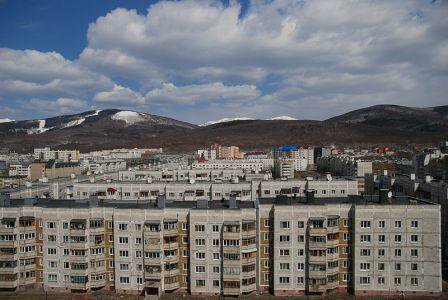 “Yesterday there was a fall of radioactive snow which led to panic in Yuzhno-Sakhalinsk. People started leaving the city, suitcases had sold out in the shops so they had to put their worldly goods into rubbish sacks! Detachments of OMON have been deployed at the airport to prevent panic and they are shooting at crowds of people who are trying to escape from the radioactive hell that is our city. Yuzhno-Sakhalinsk. 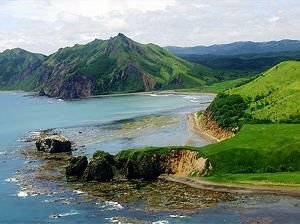 The capital of Sakhalin Island has a population of nearly 200,000 and is the administrative centre of the Sakhalin Oblast, which includes the nearby Kuril Islands. “There are huge traffic jams of right-hand drive cars on the roads: whole families are leaving, but the police take away their driving licences and let down their tyres, even the spare tyres! People are drinking iodine by the glass and eating seaweed straight out of the frozen sea….but they’re still dying of radiation”. I am the editor of an internet news agency. I found out about the earthquakes from a US Geological Survey communication two minutes after the first tremors. The magnitude quoted was 8.8. Japan and Sakhalin are in a region prone to earthquakes, so communications about earthquakes are treated fairly calmly as everyday events. But this time I sensed that it was serious. When there was a tsunami warning for the Kurile Islands and people started being evacuated, it was clear that it was going to be headline news. In the hours that followed we kept up with official communications and information from our colleagues. We rang people in the Kurile Islands and soothed the anxieties of our relatives on the mainland. Incidentally, my friends tell me that in the Kurile Islands, which are separated from the mainland both actually and metaphorically, people remained calm even when the sirens started wailing. They have grown up with the idea that the earth is unsettled, so they left their houses and went up on to higher ground, as they'd been trained to do since they were children. On the island of Kunashir in the town of Yuzhno-Kurilsk, which is anyway on a hill, they didn't have to do this…there isn't anywhere higher to go. The tsunami warning was only lifted the next day, but it had made little difference to the lives of the islanders. We were spared the destruction of the tsunami, thank heavens, but Sakhalin has been swamped by a wave of a different kind – a wave of panic. I have honestly to say that I have never encountered it at such close quarters. Out of interest I counted the number of topics created on the forum since 11 March about the earthquake on the island of Honshu, the accidents at the atomic power station, radiation….more than 2000 over 7 days! And that's only the deleted ones that don't fit the rules or duplicate previous topics. And so many "live" discussions! Each topic has 2000-3000 comments, whereas as in "peacetime" it's somewhere between 200 and 1000. When do these people find the time to do any work?! 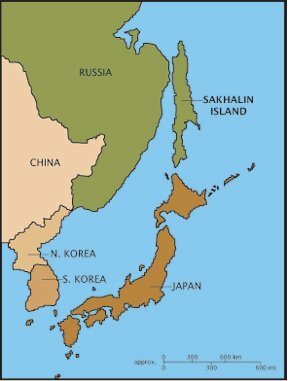 Some people on Sakhalin have never been to Moscow, but have already been to Japan. The number of single hits on the site increased by 30,000: Sakhalin people have hurled themselves into the internet in search of information, but the information is often quite contradictory because at a time like this there are not many facts. Rumours spawn other rumours, which all become entangled with the scary news summaries of the 24-hour news channel "Vesti 24" and end up in a deafening internet-shriek "We're all going to die!" The wave of panic flooded Sakhalin on 13 March. People went to work, that is they sat down at their work computers with their free internet. Each person regarded it as his duty to pass on the latest news, to share observations and knowledge, or ask a question. "The tragic situation in Japan will not affect the solution of the territorial issue [Kurile Islands]"
"Our 'top brass' are sending their children to the mainland, the radiation has reached us and they don't give a monkey's about the people!". The governor hadn't, of course, gone anywhere. To dowse the flames of popular imagination, which were already working overtime, he started appearing on the TV and in the media daily, making emollient speeches. But it didn't do much good. If the authorities are not saying much, it must be because they're hiding something. If they do say anything, they're lying! Any expression of sympathy for the Japanese is interpreted as "run for your life, escape!" All these days I have felt as though I was in a war, trying to stem rising panic in any way I could, both "globally" – at work – and "locally" – talking to my mother on the telephone ("I'm not really panicking, but it's quite scary"), trying to calm her down. In the minds of metropolitan Russia, Sakhalin is a place where bears roam the streets and people travel by reindeer, catch fish and speak a strange language. We organised an internet conference with the head of the local Emergencies Ministry, who gave an answer to every question, even the most stupid. The Russian Agency for Health and Consumer Protection started publically monitoring radiation levels in the main square of Yuzhno-Sakhalinsk and inviting anyone who wished to do so to see that everything was normal. The Emergencies Ministry published radiation meter readings online with daily statements in the media that there is no danger. But our people are still buying iodine by the litre (there have already been cases of iodine poisoning) and eating seaweed by the kilo. They are block booking plane tickets at prices ranging from 40,000 to 90,000 roubles. To anywhere…away from "infected" Sakhalin. Some people even suspect that someone is specially disseminating rumours, so as to make a quick buck out of the panic-stricken. "Oh, we're all going to die!" Where's the governor? Where's the mayor? They've run away, not doing their share. Waved them off without a thought. And ten submarines in the port standing by. At the first opportunity - off they'll fly! The panickers cried "You forgot us! We're done for!" I am tempted to say "That's enough, that's enough! We're in it together, so stop making a fuss!" In the panic of the tsunami I am constantly surprised by the resilience and dignity of people who are living through this terrible catastrophe, which has taken the lives of thousands. And it's not over yet…. All these days I have felt as though I was in a war, trying to stem rising panic in any way I could, both "globally" – at work – and "locally" – talking to my mother on the telephone, trying to calm her down. I have some friends in Japan – not in Tokyo, it's true, but on Hokkaido, which is the island closest to Sakhalin. From their relations and from the internet they have discovered what's going on in the Russian Far East at the moment. They sigh deeply and smile ruefully, "People there are panicking more than they are here…"
I have lived in Russia all my life and I understand or, more accurately, feel that if a similar tragedy were to happen here, we would take a long, long time to recover from it. The Japanese will manage to do so and I sincerely wish them all the best.